Tomorrow morning I'm to Con. 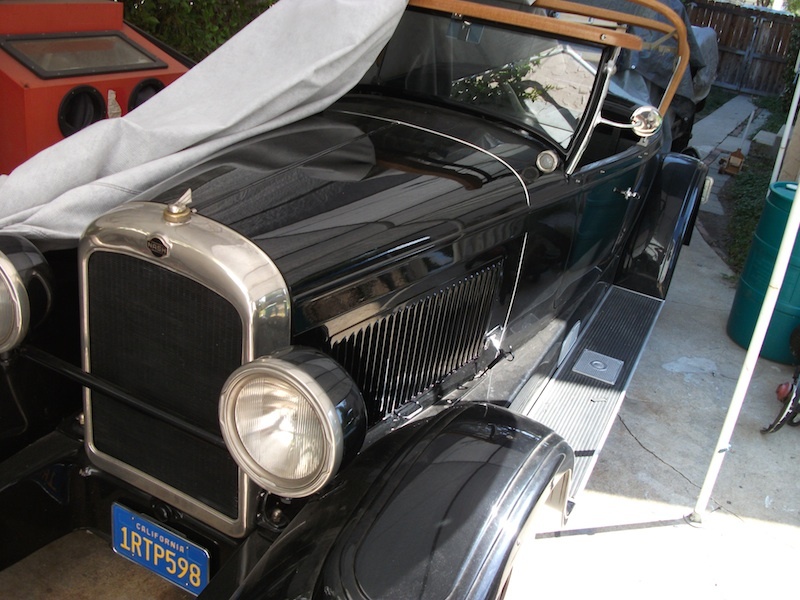 go look at a 1929 Oldsmobile for a friend. These cars are a bit out of my experience. Is there anything I should be on the look out for? The only tool I'm going to bring is a stethoscope so I can listen to the internals. Sure could use some pointers on this one. Big car. Any pics ?? On my way now. Should be there in an hour. I had a '28 Olds Coupe. The mechanicals were very reliable. It has an open driveline with rubberized fabric universal joints - just like my '05 Dodge Magnum RT. As David said, watch out for bad wood. The brakes in my '28 had three shoes per wheel and worked quite well - even though they were still mechanical. I really liked that Olds. I wish that I had never sold it. Olds made great cars throughout its long history. Unfortunately the idiots at Generic Motors decided it was much more important to keep Saturn (gee, look how well that turned out). There is very little in the way of available parts or club support for a 1929 Olds. If your friend buys one he needs to realize he will have an incredibly hard time ever selling it. A good 'old' road car. I always liked the look of this era of old cars with big headlights. But parts aren't east to come by and not as popular as old Fords. You can tie up a lot of money in this type of car if you plan to restore one. This is where many of the other period cars really make Fords look bad. A Model T was an "honest" cheap car. It made no attempt to look like a fancy, more upmarket car. Ford's efforts after 1927 to run with the big dogs certainly ensured their long term success, but to my eyes, are just a cheap car pretending to be something they aren't. An Oldsmobile was a genuinely upmarket car and one really gets a bang for their buck with a car like this if they are conscious of high quality vs. low quality in cars from that era. Sure, having the easy and cheap parts availability is a sweet attraction with the very common Fords and Chevys, but there is a deeper meaning to this game for some of us. To others, it is not that important or doesn't even enter the equation. You may "go it alone" with an Olds. Some might say that about my DeSoto. But some people don't just want another "belly button". Well how many of the would be [upmarket cars] do you see compaired to 29 Fords today? sounds like your aim is off! Bud. HA! Bud, I was thinking the same thing. The true value of a vehicle/truck/tool/chainsaw/ect. lies in it's commonality. I have a customer's Volvo in my shop right now. Is it built good? Sure. Is it common enough to provide dependable transportation, after the "new" wears off? Definitely Not. Oh, I LIKE that Nash roadster!!! But, I don't think I will ever again be able to buy a "nice" car. 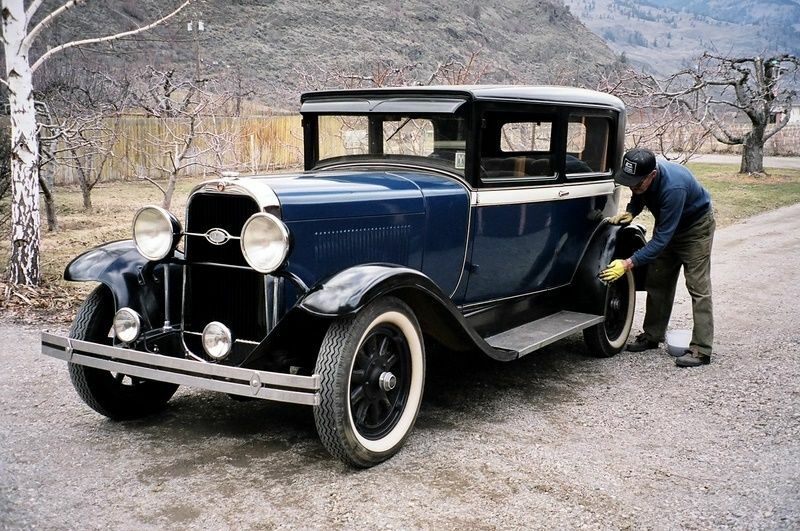 A '29 Oldsmobile would be a good car, provided you don't have to do a lot to it restoration or repair wise. They are easy to get buried under financially. They are a middle-ground car. Not full Classic, not Horseless Carriage, technically not Nickel Age (though some groups accept that year), and too old for the crowd that likes the late '30s through the '50s. The mid-size '20s to early '30s are sometimes referred to as the "ugly era", although I think they are not ugly. However, for me, I like earlier better. If you like it and can afford it, buy it. Just do so with your eyes wide open. As has been said earlier - be prepared to make your own parts. The Olds is a great car. Went to look at the 29 Olds. Very nice running car in its original patina.The inside the rough but original and intact. It ran great and went down the road very nice. It appeared to be completely original with new tires. Only the gas gage did not work but seemed to be the only non operational part on the car. There was a flanged tube coming from the block that looked something must have been attached, It appeared to be maybe a crankcase breather possibly but I had no clue to what it may had been. The price was 12500. Now in another garage that we didn't know about was a 1933 Olds with a straight 8 engine. I personally happen to love straight 8 engines. This car had a odd purple color that was applied back in the 70's that would need to be redone and a reconditioned front seat In my opinion don't feel was right for the car. It to ran very well but first and second gear were very noisey as was the transmission when at an idol. When I depressed the clutch the noise stopped until the clutch was rengaged. I did notice a small leak of gear lube coming from the front of the transmission. As the owner was trying to back it out of the garage the left front brake was stuck but some moving the car back and forth freed it up. The car wheeled down the road very nice but it was obvious that the shocks were not doing there job. Of the two cars I recommend to my friend the 33 just because I felt that if he's going to have to find parts there might be a slightly better chance of finding for the 33 but still vary hard. The owner mentioned maybe a two for one price but thats something to be seen yet, I might be interested in the 29 myself but the price would have to come down for me. Iv attended a few auctions over the summer and the price of old cars is not bring what they used to so I feel the gentleman is very high for his price but he also seems to be in a hurry to let them go.I guess we will have to see what happens. My 1941 Olds coup only brought 3800 at auction and I felt it was in great shape. The gentleman had a couple of other late 50's cars the in differant states of disrepair but very cosmetically pleasing. Thanks for all your help guys. Its been a long day so this tired old man is heading for bed. A freshly restored 28-31 Olds should bring around 16000. If you do decide to buy it, look up Phil Fischer. He is the 1929 Olds expert. He lives in Metamora, IL and is in the phone book. He has all of the parts you will need.